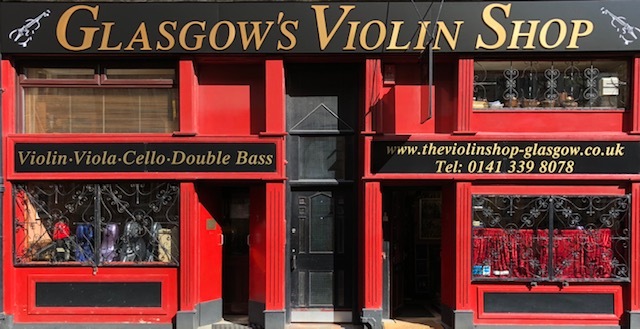 Glasgow’s Violin Shop is the city’s finest independent specialist string instrument retailer, we offer a wide selection of instruments for professional players and beginners alike, helpful advice, valuations, appraisals and always a very warm welcome. Take a step back in time as you visit our charming shop where you can admire our unusual collection of instruments and curios while relaxing in the peaceful old-world atmosphere. We buy, sell and repair stringed instruments including Violins, Violas, Cellos, Double Basses & Bows. Our experienced and friendly team can evaluate, restore and repair your instrument with loving care, from basic adjustments and set-ups to major restorations. We stock a varied range of new and antique Violins, Violas, Cellos, Double Basses & Bows. We have a small selection available to view on our website but our full collection in store is well worth a visit!